Vancouver, B.C. March 27, 2019 – Walker River Resources Corp. (“Walker” or the “Company”) (TSX-V: WRR) is pleased announce it has signed a letter of intent (“LOI”) with Smooth Rock Ventures Corp. (TSX.V: SOCK) (“Smooth Rock”), to enter into an Exploration Agreement with Option form a Joint Venture on the Garfield Flats Project, located in Mineral County, Nevada about 18 miles southeast of the town of Hawthorne, NV. The Garfield Flats Project consists of 106 unpatented mining claims having a combined area of approximately 858 hectares (2120 acres) that covers several past producing small-scale high-grade gold and copper mines, altered and mineralized zones discovered by previous geological compilations and mapping of the historical workings. Historical sampling on the project has revealed the presence of copper, bismuth, and antimony as well as pervasive lower grade gold mineralization, cut by vein structures (some previously mined) of higher-grade gold. Previous induced polarization surveys also denoted the presence of significant coincident I.P. anomalies. These factors clearly demonstrate the potential of this relatively unexplored project for the discovery of significant gold mineralization. The Garfield Flats Project is within the Walker Lane shear zone, a 60-mile-wide structural corridor extending in a southeast direction from Reno, Nevada, located 18 miles southeast of Hawthorne, NV along U.S. Highway 95. The project has excellent year-round access and infrastructure within Mineral County, one of the most pro-mining counties in the pro-mining states and highest-grade gold districts of Nevada. The Garfield Flats Project is located adjacent to New Range Gold Corp’s Pamlico project. In close proximity to several past producing mines including the Bodie, Aurora, Borealis, Pamlico, Evening Star, Mabel, Mindoro and Camp Douglas Mines. Held by private interests for most of its history, Garfield Flats remains very underexplored with exceptional potential for new discoveries on several exploration targets with multiple zones. Smooth Rock has signed an “LOI” with Walker River to negotiate a definitive Exploration Agreement with Option to form a Joint Venture on the Garfield Flats Property. Smooth Rock can earn an undivided fifty percent (50%) interest in the Garfield Flats Property by funding $600,000.00 in Exploration Expenditures as follows: (a) for an initial 25% interest of the Garfield Flats project $300,000 in exploration expenditures within a one-year period and (b) for an additional 25% interest $300,000 in exploration expenditures on or before the second anniversary and (c) a 50/50 joint venture will be formed between Walker River and Smooth Rock. Smooth Rock may accelerate any of the above earn-in periods at its option. Walker shall be the operator of the exploration during the earn-in period. The Garfield Property is subject to an underlying 2% Gross Production Royalty. The parties expect to complete their respective due diligence and execute a definitive Exploration Agreement with Option form a Joint Venture to replace the LOI within the next 30 days. FOR FURTHER INFORMATION PLEASE CONTACT: Walker River Resources Corp.
is pleased to announce since February 15, 2019 it has received proceeds of $878,578.48 from the exercise of 7,513,154 previously issued common share purchase warrants. As of the date of this news release, the Company now has 128,927,269 common shares issued and outstanding. The Company intends to use the proceeds of the warrant exercises for work on the Company’s Lapon Canyon Gold Project and general working capital. Finally, the Company is pleased to announce the appointment of Mr. Renè Lessard to its board of directors. Renè is an independent sales consultant. He was the Sales Manager of Campagna Motors Inc. and T-Rex Vehicles Inc. Renè is a former director of Nemaska Lithium Inc. (TSX:NMX) and Monarques Resources Inc. (TSX:MQR). The Company also announces the resignation of Thomas Schuster as a director of the Company. The Company would like to thank Mr. Schuster for his contributions to the Company during his appointment to the Board of Directors and wishes him well in his future endeavors. Mr. Schuster will remain a consultant to the Company. FOR FURTHER INFORMATION PLEASE CONTACT: Walker River Resources Corp. (TEL)- (819) 874-0030, (FAX)-(819) 825-1199 Email: info@wrrgold.com Website: www.wrrgold.com NEITHER TSX VENTURE EXCHANGE NOR ITS REGULATION SERVICE PROVIDER (AS THAT TERM IS DEFINED IN THE POLICIES OF THE TSX VENTURE EXCHANGE) ACCEPTS RESPONSIBILITY FOR THE ADEQUACY OR ACCURACY OF THIS NEWS RELEASE. Vancouver, B.C. February 26, 2019 – Walker River Resources Corp. (“Walker” or the “Company”) (TSX-V: “WRR”) is pleased to announce additional drill results from the late 2018 reverse circulation (“RC”) drill program on the Lapon Canyon Gold Project, located approximately 60 kilometres southeast of Yerington, Nevada. RC drill hole LC18-28 returned 10.23 g/t Au (uncut) over 19.9 meters including 78.1 g/t over 1.5 meters at a depth of 50.3 meters and 221 g/t over 1.5 meters at a depth of 57.9 meters. RC drill hole LC18-30 returned 93.5 g/t Au over 1.5 meters at a depth of 42.7 meters. Walker’s initial geological mapping and prospecting on the Project followed by its drill programs has demonstrated the potential for the emplacement of significant gold mineralization. The 2018 drilling focused on infill and expansion drilling at the Lapon Rose zone, as well as exploration and drilling new targets including other fault alteration zones, which in some instances show evidence of previous workings. Significantly in Hole LC18-30, drilling intersected 93.5 g/t Au immediately prior to encountering old mine workings. These workings were intersected over 9.1 meters at a depth of 44.2 meters. This continues to verify historical data of the positioning of previously reported workings, in presently inaccessible mined out areas. Consistently, since the start up of drilling on the project, all holes drilled within the Lapon Rose zone returned gold values with the majority (80%) returning significant grades and widths in en echelon zones of gold enrichment. The Lapon Rose Zone has now been drilled over a strike length of some 365 meters. The width of the zone exceeds 150 meters, and the zone has been drilled over a vertical extent of 400 meters. The zone remains open along strike and depth. The 2018 drill program was designed to expand gold mineralized zones discovered by the Company, to discover and delineate new gold mineralized zones. Further results from the 2018 drill program are expected to be released shortly. returning 20.6 ounces per ton. (National Instrument 43-101, Montgomery and Barr, 2004). Additional work on the Project in the following years, included the installation of a ball mill and milling facilities. Vancouver, B.C. February 19, 2019 – Walker River Resources Corp. (“Walker” or the “Company”) (TSX-V: “WRR”) is pleased to announce additional drill results from the late 2018 reverse circulation (“RC”) drill program on the Lapon Canyon Gold Project, located approximately 60 kilometres southeast of Yerington, Nevada. Vancouver, B.C. January 28th, 2019 – Walker River Resources Corp. (“Walker” or the “Company”) (TSX-V: “WRR”)is pleased to announce the appointment of Earle G. Hall to its Advisory Committee. Mr. Earle G. Hall is an internationally recognized Canadian entrepreneur, visionary and innovator in several different fields of technology. He has spearheaded projects and start-ups in the gaming, entertainment, heavy tech, CRM, video game and special effects segments of the technology spectrum. He currently serves as the CEO of AXES network, an IoT Fintech specialized in the casino industry. He is also the Gaming Standards Association Chair of the Blockchain Committee. Earle is a graduate of the Royal Military College and a Veteran Officer of the Canadian Army. He holds a Master’s Degree in Public Administration and is currently pursuing a doctorate in Organizational Psychology. Earle taught the Management of Information and New Technology at the Master’s Degree level for 10 years while researching the emergence of the digital economy. Earle currently focuses on big data, information correlation, predictability and behaviour triggers. Earle’s expertise in blockchain stems from his research in information management and is heavily influenced by his military background in intermodal logistics. Earle has done extensive research in neuroscience and has spoken at many international events such as TEDx, Wanderlust and others on the Science of Happiness, Mindfulness and Success. His passion for the human brain and the search for purpose and performance have had tremendous influence on his focus on company culture as the essence of success. Finally, the Company is pleased to announce Mr. Christopher Hobbs, CA current Chief Financial Officer of the Company, has been appointed to its board of directors. Over the past 20 years, Chris has acted as Chief Financial Officer and director for several private and public companies operating in the natural resource, health sciences, brokerage/securities firms and technology sectors. Chris has extensive experience in the investment banking sector based in Toronto, Ontario. Mr. Hobbs is a member of the Chartered Accountants of Ontario and holds a Bachelor of Business Administration from the Schulich School of Business at York University. Walker River Resources Corp. (TSX.V:WRR) is an exploration stage company, engaged in the identification, evaluation, acquisition, and exploration of mineral properties in Nevada. WRR holds a 100% interest in the Lapon Canyon gold project consisting of 98 lode claims, and a 100% interest in a lease agreement on the Garfield Flats project, both located in the prolific Walker Lane Trend of Nevada. Vancouver, B.C. December 24, 2018 – Walker River Resources Corp. (“Walker” or the “Company”) (TSX-V: “WRR”) is pleased to announce that it has completed the second and final tranche of its previously announced private placement (see news release 11-05-18) by issuing 10,290,000 common shares at a price of $0.05 per share for gross proceeds of $514,500. The Company has raised total gross proceeds of $700,000 under this private placement. Each Unit consisted of one common share (a “Share”) and one Share purchase warrant (the “Warrant”), whereby each Warrant shall be exercisable into one Share for a period of two (2) years from closing at a price of $0.10 per Share. An insider of the Company, Michel David, acquired 180,000 Units directly in the final tranche. The participation by an insider in the Private Placement is considered to be a “related party transaction” as defined under Multilateral Instrument 61-101 (“MI 61-101”). The transaction is exempt from the formal valuation and minority shareholder approval requirements of MI 61-101, as neither the fair market value of the securities being issued nor the consideration being paid exceeds 25% of Walker’s market capitalization. The material change report in connection with the Private Placement was not filed 21 days in advance of the closing of the first tranche of the Private Placement for the purposes of Section 5.2(2) of MI 61-101 on the basis that the Subscription Agreement under the Private Placement was not available to the Company until shortly before closing. Proceeds of the Private Placement will be used for work on the Company’s mineral properties and general working capital. The Company has paid $6280.00 cash in commissions on the second tranche of the private placement, and issued 125,600 non-transferable finders’ warrants, each entitling its holder to acquire one common share at $0.10 for a two (2) period after closing of the private placement. All securities to be issued in connection with the second and final tranche of the Private Placement shall be subject to a four-month hold period in accordance with applicable securities legislation. Closing of the second tranche of the Private Placement shall be subject to receipt of acceptance by the TSX Venture Exchange. Finally, the Company announces the resignation of Denis St. Hilaire as a director of the Company. The Company would like to thank Mr. Hilaire for his contributions to the Company during his appointment to the Board of Directors. Vancouver, B.C. November 5, 2018 – Walker River Resources Corp. (“Walker” or the “Company”) (TSX-V: “WRR”) announces it has arranged a non-brokered private placement of up to 14,000,000 units (the “Units”, and each a “Unit”) at a price of $0.05 per Unit to raise aggregate proceeds of up to $700,000 (the “Private Placement”). The Company has completed the first tranche of the Private Placement raising gross proceeds of $185,500.00 from the issuance of an aggregate 3,710,000 Units. Each Unit shall consist of one common share (a “Share”) and one Share purchase warrant (the “Warrant”), whereby each Warrant shall be exercisable into one Share for a period of two (2) years from closing at a price of $0.10 per Share. An insider of the Company, Michel David, acquired 620,000 Units directly. The participation by an insider in the Private Placement is considered to be a “related party transaction” as defined under Multilateral Instrument 61-101 (“MI 61-101”). The transaction is exempt from the formal valuation and minority shareholder approval requirements of MI 61-101, as neither the fair market value of the securities being issued nor the consideration being paid exceeds 25% of Walker’s market capitalization. The material change report in connection with the Private Placement was not filed 21 days in advance of the closing of the first tranche of the Private Placement for the purposes of Section 5.2(2) of MI 61-101 on the basis that the Subscription Agreement under the Private Placement was not available to the Company until shortly before closing. Proceeds of the Private Placement will be used for work on the Company’s mineral properties and general working capital. The Company may pay finders’ fees in respect of subscriptions from investors introduced by finders. Finders’ fees shall be payable in cash and Warrants equal to 8% of the Units sold to investors introduced by finders. The Company has paid $4760.00 cash in commissions on the first tranche of the private placement, and issued 95,200 non-transferable finders’ warrants, each entitling its holder to acquire one common share at $0.10 for a two (2) period after closing of the private placement. All securities to be issued in connection with the Private Placement shall be subject to a four-month hold period in accordance with applicable securities legislation. Closing of the first tranche and the remainder of the Private Placement shall be subject to receipt of acceptance by the TSX Venture Exchange. The securities offered have not been, and will not be, registered under the U.S. Securities Act of 1933, as amended (the “U.S. Securities Act”), or any U.S. state securities laws, and may not be offered or sold in the United States or to, or for the account or benefit of, a U.S. Person (as defined in Regulation S under the U.S. Securities Act) absent registration or an applicable exemption from the registration requirements of the U.S. Securities Act and applicable U.S. state securities laws. This news release shall not constitute an offer to sell or the solicitation of an offer to buy securities in the United States or to, or for the account or benefit of, any U.S. Person, nor shall there be any sale of these securities in any jurisdiction in which such offer, solicitation or sale would be unlawful. The Company also announces planning is underway for a reverse circulation (“RC”) drill program on the Company’s wholly-owned Lapon Canyon Gold Project (the “Project”). The drill program is based on the results from the previous work on the Project. Drilling will focus on infill and expansion of the Lapon Rose zone, including follow-up drilling at the new discovery in Hole RC 17-19 (18.6 g/t Au (uncut) over 6.1 metres), located 325 metres away and 200 metres higher than the last known gold mineralization. The drill program is scheduled to begin on or about November 19, 2018. Walker’s initial geological mapping and prospecting on the Project demonstrated the potential for the emplacement of significant gold mineralization. Previous drilling in 2015, 2016 and 2017 confirmed this potential. The Lapon Canyon Gold Project is located approximately 60 kilometres southeast of Yerington, Nevada, and consists of 96 claims (1940 acres) easily accessible by secondary state roads. A state grid power transmission line passes within three kilometres of the Project. The Company owns 100% of the properties with a 2% NSR payable on 36 of the claims. The Lapon Canyon Gold Project is cut by a series of steeply dipping cross fault structures cutting across the Walker trend, analogous to other cross fault structures responsible for many gold and base metal deposits in the world. These faults are heavily sheared and altered (sericite, iron oxides) with abundant silica, varying in width from 60 to 300 metres. Four of these structures have been discovered at Lapon, and at least two can be traced for over four kilometres. Small scale high grade mining began on the project in 1914. Approximately 600 metres of drifts and raises were developed from two adits and a two-stamp mill was built. Further underground work was carried out, returning numerous assay values in the range of one ounce per ton, with a sample at the end of an adit returning 20.6 ounces per ton. (National Instrument 43-101, Montgomery and Barr, 2004). Additional work on the Project in the following years included the installation of a ball mill and milling facilities. The scientific and technical content and interpretations contained in this news release have been reviewed, verified and approved by E. Gauthier, geol., Eng (OIQ) a director of the Company, a Qualified Person as defined by NI 43-101, Standards of Disclosure for Mineral Projects. Vancouver, B.C. 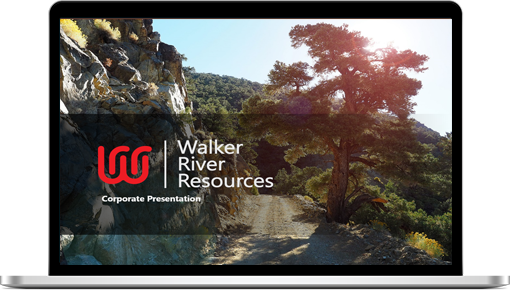 April 11, 2018 – Walker River Resources Corp. (“Walker” or the “Company”) (TSX-V: “WRR”) announces it has closed a second-tranche of $72,000.00 in a non-brokered private placement, bringing the total gross proceeds raised to $380,200.00. The Company has issued 1,200,000 units at a price of $0.06 per unit for gross proceeds of $72,000.00 in the second tranche. Each unit consists of one common share (a “Share”) and one share purchase warrant (the “Warrant”). Each Warrant will entitle the holder to purchase one additional Common Share in the capital of the Company at a price of $0.10, for a period of 24 months following the closing of the Offering (the “Closing”). The Company completed the first tranche of the Private Placement (see news release 03-13-18) raising gross proceeds of $308,200.00 from the issuance of an aggregate 5,136,667 Units. Each Unit containing the same terms as the second-tranche above. The Warrants shall contain an acceleration provision that, in the event the closing sale price of Walker’s Shares on the TSX Venture Exchange is $0.25 or greater for a period of ten (10) consecutive trading days, then the warrant holders will have thirty (30) days to exercise their warrants; otherwise the warrants will expire on the 31st day. All securities issued above are subject to a hold period expiring on August 11, 2018, being four months and one day after closing of the private placement. A planned 10,000-meter drill program (45-50 holes) based on the results from previous work on the Lapon Canyon project. The Company acquired an additional 60 claims in 2017 that covers possible on strike extensions of the fault structures controlling the mineralization. The discovery of new gold mineralization (RC 17-19; 18.6 g/t Au (uncut) over 6.1 meters) located 325 meters away and 200 meters higher than the last known gold mineralization. It is presently unknown if this is an extension of the Lapon Rose or an entirely new zone. With the discovery at this location, the vertical extent of gold mineralization now exceeds 400 meters. Drilling highlights include (all previously announced) 7.6 meters at 8.96 g/t,13.7 meters at 18.4 g/t, and 6.1 meters of 32 g/t. The Lapon Canyon project consists of 96 claims (1940 acres), easily accessible by secondary state roads. A state grid power transmission line passes within three kilometres of the project. The Company owns 100% of the properties with a 2% NSR payable on 36 of the claims. Drilling Targets Walker has planned a 10,000-meter drill program (45 – 50 holes) based on the results from the previous work on the project. Initial drilling will focus on infill and expansion of the Lapon Rose zone, follow up drilling at the new discovery in Hole RC 17-19 and drilling other exploration targets on the property. These new targets include several large fault alteration zones, which in some instances show evidence of previous workings. The Company also announces that it has retained Fladgate Exploration Consulting Corp. (“Fladgate”) of Thunder Bay, ON., a full-service mineral exploration consulting firm. Fladgate will be responsible for the management and supervision of the exploration programs at the Lapon Canyon project. Fladgate will initially complete the formation, interpretation, and compilation of the Lapon Project’s digital database. Fladgate’s initial interpretations of the Lapon digital database will greatly enhance the planning and design of Walker’s upcoming 2018 drill program. Michel David, President states: “We are very excited and encouraged by the past drill results which confirm the potential of the project. The arrival of Fladgate on the project will greatly aid in the acceleration of drilling, geological mapping and understanding of the gold mineralization at Lapon.” About the Lapon Canyon Project. The Lapon Canyon Project is cut by a series of steeply dipping cross fault structures cutting across the Walker trend, analogous to other cross fault structures responsible for many gold and base metal deposits in the world. These faults are heavily sheared and altered (sericite, iron oxides) with abundant silica, varying in width from 60 to 300 meters. Four of these structures have been discovered at Lapon, and at least two can be traced for over four kilometers. Small scale high grade mining began on the project in 1914. Approximately 600 meters of drifts and raises were developed from two adits and a two-stamp mill was built. Further underground work was carried out, returning numerous assay values in the range of one ounce per ton, with a sample at the end of an adit returning 20.6 ounces per ton. (National Instrument 43-101, Montgomery and Barr, 2004). Additional work on the Project in the following years, included the installation of a ball mill and milling facilities. The scientific and technical content and interpretations contained in this news release have been reviewed, verified and approved by E. Gauthier, geol., Eng (OIQ) a director of the Company, an Qualified Person as defined by NI 43-101, Standards of Disclosure for Mineral Projects. ON BEHALF OF THE BOARD OF DIRECTORS Michel David, Chief Executive Officer and Director FOR FURTHER INFORMATION PLEASE CONTACT: Walker River Resources Corp. (TEL)- (819) 874-0030, (FAX)-(819) 825-1199 Email: info@wrrgold.com Website: www.wrrgold.com NEITHER TSX VENTURE EXCHANGE NOR ITS REGULATION SERVICE PROVIDER (AS THAT TERM IS DEFINED IN THE POLICIES OF THE TSX VENTURE EXCHANGE) ACCEPTS RESPONSIBILITY FOR THE ADEQUACY OR ACCURACY OF THIS NEWS RELEASE. A late intrusive diorite structure is sterile but its structural emplacement is important to the location and morphology of the Lapon Rose Zone and the included en echelon zones of gold enrichment. The surrounding fresh granite is generally un-mineralized, though drilling has encountered gold values within the granite, often near contacts within the Lapon Rose Zone. Significantly since the start up of drilling on the project, all holes drilled within the Lapon Rose zone returned gold values with the majority (80%) returning significant grades and widths in en achelon zones of gold enrichment. With the discovery of hole LC17-19 (news release 11-08-17), the vertical extent of gold mineralization now exceeds 400 meters. *Grade cut to 34 g/t **True widths approx. 80% Hole LC 17-22 was lost in intense fracturing at the 30 meter level, and remained within the Zone. The initial target at this hole was at 100 meters down. Four holes in the 2017 RC drill program were lost or abandoned prior to reaching their targets due to ground and fault issues. The Lapon Rose Zone has now been drilled over a strike length of some 365 meters, a width exceeding 150 meters. and a height of over 200 meters. In addition, and significantly, the new gold discovery of RC drill hole LC 17-19 (news release 11-08-17) is located 325 meters away and 200 meters in altitude higher than the last known position of the Lapon Rose Zone. It is not known at this time if this new discovery is an extension of the Lapon Rose or a new zone. The 2017 drill program is designed to expand gold mineralized zones discovered by the company and to discover and delineate new gold mineralized zones. Further results from the 2017 drill program will be released as they become available. Michel David, President states: “We are very excited and encouraged by these and past drill results which now confirm the potential of the project. Most of the holes drilled in the Lapon Rose zone have returned significant gold grades and widths. We have also extended the strike length and width of the gold mineralization in Lapon Rose, and have also shown that the gold mineralization is present over 400 vertical meters. The zone is also open at depth and strike. We will continue our exploration at Lapon and are excited about the future at this project.” About the Lapon Project The Lapon Project consists of 96 claims (1,940 acres) situated in the Wassuk Range, easily accessible by secondary state roads from the main highway (25 kilometres). A state grid power transmission line passes within three kilometres of the Lapon Project. The Lapon Project is located within the Walker Lane shear zone, a 100-kilometre-wide structural corridor extending in a southeast direction from Reno, Nevada. Within this trend, numerous gold, silver, and copper mines are located, notably the historic Comstock Lode mines in Virginia City. Also, the past producing Esmeralda/Aurora gold mine, with reported production of some one million ounces and the Anaconda open pit copper mine in Yerington, Nevada. The Lapon Project is cut by a series of steeply dipping cross fault structures cutting across the Walker trend, analogous to other cross fault structures responsible for many gold and base metal deposits in the world. These faults are heavily sheared and altered (sericite, iron oxides) with abundant silica, varying in width from 60 to 300 meters. Four of these structures have been discovered at Lapon, and at least two can be traced for over four kilometers. Small scale high grade mining began on the project in 1914. Approximately 600 meters of drifts and raises were developed from two adits and a two-stamp mill was built. Further underground work was carried out, returning numerous assay values in the range of one ounce per ton, with a sample at the end of an adit returning 20.6 ounces per ton. (National Instrument 43-101, Montgomery and Barr, 2004). Additional work on the Project in the following years, included the installation of a ball mill and milling facilities. Sampling Methodology, Chain of Custody, Quality Control and Quality Assurance All sampling was conducted under the supervision of the Company’s project geologists and the chain of custody from the drill to the sample preparation facility was continuously monitored. A blank or certified reference material was inserted approximately every tenth sample. The Lapon samples were delivered to ALS Minerals certified laboratory facility in Reno, NV. The samples were crushed, pulverized and the sample pulps digested and analyzed for gold using fire assay fusion and a 50g gravimetric finish. Higher grade samples used a 1kg screen fire assay with screen to 100 microns and 50g gravimetric finish The scientific and technical content and interpretations contained in this news release have been reviewed, verified and approved by E. Gauthier, geol., Eng (OIQ) a Qualified Person as defined by NI 43-101, Standards of Disclosure for Mineral Projects. ON BEHALF OF THE BOARD OF DIRECTORS Michel David, Chief Executive Officer and Director FOR FURTHER INFORMATION PLEASE CONTACT: Walker River Resources Corp. (TEL)- (819) 874-0030, (FAX)-(819) 825-1199 Email: info@wrrgold.com Website: www.wrrgold.com NEITHER TSX VENTURE EXCHANGE NOR ITS REGULATION SERVICE PROVIDER (AS THAT TERM IS DEFINED IN THE POLICIES OF THE TSX VENTURE EXCHANGE) ACCEPTS RESPONSIBILITY FOR THE ADEQUACY OR ACCURACY OF THIS NEWS RELEASE. Vancouver, B.C. November 8, 2017 – Walker River Resources Corp. (“Walker” or the “Company”) (TSX-V: “WRR”) is pleased to announce a new gold discovery from the 2017 reverse circulation (“RC”) drill program on the Lapon Canyon gold project, located approximately 60 kilometres southeast of Yerington, Nevada. The new discovery is located approximately 200 meters above and 325 meters away to the north from the last known gold mineralization on the project. Highlights Include: RC drill hole LC 17-19 intersected 18.6 grams per tonne gold (uncut) over 6.1 meters from 15.2 to 21.3 meters. *Grade cut to 34 g/t **True widths approx. 80% Additional from the above results, RC drill hole LC 17-19 returned 4.6 grams (uncut) over 25.9 meters from 0 to 25.9 meters in the mineralized zone. The drill program is designed to expand gold mineralized zones discovered by the company and to discover and delineate new gold mineralized zones. Further results from the 2017 drill program will be released as they become available. About the Lapon Project The Lapon Project consists of 96 claims (1,940 acres) situated in the Wassuk Range, easily accessible by secondary state roads from the main highway (25 kilometres). A state grid power transmission line passes within three kilometres of the Lapon Project. The Lapon Project is located within the Walker Lane shear zone, a 100-kilometre-wide structural corridor extending in a southeast direction from Reno, Nevada. Within this trend, numerous gold, silver, and copper mines are located, notably the historic Comstock Lode mines in Virginia City. Also, the past producing Esmeralda/Aurora gold mine, with reported production of some one million ounces and the Anaconda open pit copper mine in Yerington, Nevada. The Lapon Project is cut by a series of steeply dipping cross fault structures cutting across the Walker trend, analogous to other cross fault structures responsible for many gold and base metal deposits in the world. These faults are heavily sheared and altered (sericite, iron oxides) with abundant silica, varying in width from 60 to 300 meters. Four of these structures have been discovered at Lapon, and at least two can be traced for over four kilometers. Small scale high grade mining began on the project in 1914. Approximately 600 meters of drifts and raises were developed from two adits and a two-stamp mill was built. Further underground work was carried out, returning numerous assay values in the range of one ounce per ton, with a sample at the end of an adit returning 20.6 ounces per ton. (National Instrument 43-101, Montgomery and Barr, 2004). Additional work on the Project in the following years, included the installation of a ball mill and milling facilities. Sampling Methodology, Chain of Custody, Quality Control and Quality Assurance All sampling was conducted under the supervision of the Company’s project geologists and the chain of custody from the drill to the sample preparation facility was continuously monitored. A blank or certified reference material was inserted approximately every tenth sample. The Lapon samples were delivered to ALS Minerals certified laboratory facility in Reno, NV. The samples were crushed, pulverized and the sample pulps digested and analyzed for gold using fire assay fusion and a 50g gravimetric finish. Higher grade samples used a 1kg screen fire assay with screen to 100 microns and 50g gravimetric finish The scientific and technical content and interpretations contained in this news release have been reviewed, verified and approved by E. Gauthier, geol., Eng (OIQ) a Qualified Person as defined by NI 43-101, Standards of Disclosure for Mineral Projects. ON BEHALF OF THE BOARD OF DIRECTORS Michel David, Chief Executive Officer and Director FOR FURTHER INFORMATION PLEASE CONTACT: Walker River Resources Corp. (TEL)- (819) 874-0030, (FAX)-(819) 825-1199 Email: info@wrrgold.com Website: www.wrrgold.com NEITHER TSX VENTURE EXCHANGE NOR ITS REGULATION SERVICE PROVIDER (AS THAT TERM IS DEFINED IN THE POLICIES OF THE TSX VENTURE EXCHANGE) ACCEPTS RESPONSIBILITY FOR THE ADEQUACY OR ACCURACY OF THIS NEWS RELEASE. Vancou Module Settings ver, B.C. October 4, 2017 – Walker River Resources Corp. (“Walker” or the “Company”) (TSX-V: “WRR”) is pleased to announce initial results from the 2017 reverse circulation (“RC”) drill program on the Lapon Canyon gold project, located approximately 60 kilometres southeast of Yerington, Nevada. The present drill program is designed to expand gold mineralized zones discovered by the company in 2015 and 2016, and to discover and delineate new gold mineralized zones. These are preliminary results from the 2017 drill program and further assays are pending. Highlights Include: RC drill hole LC 17-14 intersected 12.85 grams per tonne gold over 9.2 meters from 10.6 to 19.8 meters. RC drill hole LC 17-13 intersected 21.03 grams per tonne gold over 3.0 meters from 22.9 to 25.9 meters. **True widths approx. 80% in LC 17-14 Initial drilling began on the project in Dec 2015 and 2016. Highlights (previously announced) included 77.62 g/t gold (uncut) over 12.2 meters in RC drill hole LC 16-10; 48.02 g/t gold (uncut) over 13.7 meters; 39.17 g/t gold (uncut) over 9.2 meters in RC drill hole LC 16-12; 7.62 g/t gold over 18.3 meters in RC drill hole LC 15-03; 7.84 g/t gold over 22.9 meters in RC drill hole LC 15-02, among others. The drill program is planned to resume at the end of this month. Further results will be released as available. Vancouver, B.C. October 4, 2017 – Walker River Resources Corp. (“Walker” or the “Company”) (TSX-V: “WRR”) is pleased to announce initial results from the 2017 reverse circulation (“RC”) drill program on the Lapon Canyon gold project, located approximately 60 kilometres southeast of Yerington, Nevada. The present drill program is designed to expand gold mineralized zones discovered by the company in 2015 and 2016, and to discover and delineate new gold mineralized zones. These are preliminary results from the 2017 drill program and further assays are pending. Highlights Include: RC drill hole LC 17-14 intersected 12.85 grams per tonne gold over 9.2 meters from 10.6 to 19.8 meters. RC drill hole LC 17-13 intersected 21.03 grams per tonne gold over 3.0 meters from 22.9 to 25.9 meters. **True widths approx. 80% in LC 17-14 Initial drilling began on the project in Dec 2015 and 2016. Highlights (previously announced) included 77.62 g/t gold (uncut) over 12.2 meters in RC drill hole LC 16-10; 48.02 g/t gold (uncut) over 13.7 meters; 39.17 g/t gold (uncut) over 9.2 meters in RC drill hole LC 16-12; 7.62 g/t gold over 18.3 meters in RC drill hole LC 15-03; 7.84 g/t gold over 22.9 meters in RC drill hole LC 15-02, among others. The drill program is planned to resume at the end of this month. Further results will be released as available. ON BEHALF OF THE BOARD OF DIRECTORS Michel David, Chief Executive Officer and Director FOR FURTHER INFORMATION PLEASE CONTACT: Walker River Resources Corp. (TEL)- (819) 874-0030, (FAX)-(819) 825-1199 Email: info@wrrgold.com Website: www.wrrgold.com NEITHER TSX VENTURE EXCHANGE NOR ITS REGULATION SERVICE PROVIDER (AS THAT TERM IS DEFINED IN THE POLICIES OF THE TSX VENTURE EXCHANGE) ACCEPTS RESPONSIBILITY FOR THE ADEQUACY OR ACCURACY OF THIS NEWS RELEASE. is pleased to report it has closed its non-brokered private placement previously announced on September 6, 2017, for gross proceeds of $465,000.00. The non-brokered private placement consisted of 4,650,000 units (the “Units”, and each a “Unit”) at a price of $0.10 per (the “Private Placement”). Each Unit consisted of one common share (the “Share”) and one Share purchase warrant (the “Warrant”), whereby each Warrant is exercisable into one Share for a period of two (2) years from closing at a price of $0.15 per Share. The Warrants contain an acceleration provision that, in the event the closing sale price of Walker’s Shares on the TSX Venture Exchange is $0.30 or greater for a period of ten (10) consecutive trading days, then the warrant holders will have thirty (30) days to exercise their warrants; otherwise the warrants will expire on the 31st day. All securities issued above are subject to a hold period expiring on January 9, 2018, being four months and one day after closing of the private placement. Proceeds of the private placement will be used for work on the company’s mineral properties and general working capital. ON BEHALF OF THE BOARD OF DIRECTORS ON BEHALF OF THE BOARD OF DIRECTORS Michel David, Chief Executive Officer and Director FOR FURTHER INFORMATION PLEASE CONTACT: Walker River Resources Corp. (TEL)- (819) 874-0030, (FAX)-(819) 825-1199 Email: info@wrrgold.com Website: www.wrrgold.com NEITHER TSX VENTURE EXCHANGE NOR ITS REGULATION SERVICE PROVIDER (AS THAT TERM IS DEFINED IN THE POLICIES OF THE TSX VENTURE EXCHANGE) ACCEPTS RESPONSIBILITY FOR THE ADEQUACY OR ACCURACY OF THIS NEWS RELEASE. Vancouver, B.C. September 6, 2017 – Walker River Resources Corp. (“Walker” or the “Company”) (TSX-V: “WRR”) announces it is arranging a non-brokered private placement of up to 5,000,000 units (the “Units”, and each a “Unit”) at a price of $0.10 per Unit to raise aggregate proceeds of up to $500,000 (the “Private Placement”). Each Unit shall consist of one common share (the “Share”) and one Share purchase warrant (the “Warrant”), whereby each Warrant shall be exercisable into one Share for a period of two (2) years from closing at a price of $0.15 per Share. The Warrants shall contain an acceleration provision that, in the event the closing sale price of Walker’s Shares on the TSX Venture Exchange is $0.30 or greater for a period of ten (10) consecutive trading days, then the warrant holders will have thirty (30) days to exercise their warrants; otherwise the warrants will expire on the 31st day. Proceeds of the private placement will be used for work on the company’s mineral properties and general working capital. All securities to be issued in connection with the Private Placement shall be subject to a four-month hold period in accordance with applicable securities legislation. Closing of the Private Placement shall be subject to receipt of acceptance by the TSX Venture Exchange. E.Gauthier, Geol, Eng (OIQ) acts as the qualified person to the Company and has approved the contents of this release. ON BEHALF OF THE BOARD OF DIRECTORS Michel David, Chief Executive Officer and Director FOR FURTHER INFORMATION PLEASE CONTACT: Walker River Resources Corp. (TEL)- (819) 874-0030, (FAX)-(819) 825-1199 Email: info@wrrgold.com Website: www.wrrgold.com NEITHER TSX VENTURE EXCHANGE NOR ITS REGULATION SERVICE PROVIDER (AS THAT TERM IS DEFINED IN THE POLICIES OF THE TSX VENTURE EXCHANGE) ACCEPTS RESPONSIBILITY FOR THE ADEQUACY OR ACCURACY OF THIS NEWS RELEASE. Vancouver, B.C. July 19, 2017 – Walker River Resources Corp. (“Walker” or the “Company”) (TSX-V: “WRR”) is pleased to announce that drilling has begun on its wholly owned Lapon Canyon Gold Project, located approximately 60 kilometres southeast of Yerington, Nevada. (the “Lapon Project”). The Lapon Project consists of 96 claims (1,940 acres) situated in the Wassuk Range, easily accessible by secondary state roads from the main highway (25 kilometres). A state grid power transmission line passes within three kilometres of the Lapon Project. Finally, the Company announces it has received TSX Venture Exchange approval for the property purchase agreement with Nevada Canyon Gold Corp. (“Nevada Canyon”), previously announced on July 6, 2017. The Company now has 100% ownership of the Lapon Project, subject to a 2% N.S.R royalty payable to previous lease holders and the original owners. Under terms of the property purchase agreement, the Company acquired Nevada Canyon’s 30% interest in the Lapon Project in exchange for 9,100,000 common shares of the Company and warrants to acquire an additional 11,900,000 common shares. Each warrant is exercisable for a period of five years without further consideration into one common share in the capital of the Company. The terms of the warrants contain a provision that Nevada Canyon cannot exercise any warrants which would result in it owning 10% or more of the issued and outstanding shares of the Company. All securities issued above are subject to a hold period expiring on November 20, 2017, being four months and one day after closing of the property purchase agreement. About the Lapon Project Previous geological mapping and prospecting on the Lapon Project demonstrated the potential for the emplacement of significant gold mineralization. Drilling in late 2015 and 2016 confirmed this potential. Drilling highlights (previously announced) included 77.62 g/t Au over 12.2 meters (uncut); 48.02 g/t over 13.7 meters (uncut); 39.17 g/t over 9.2 meters (uncut); among others. The drill program confirmed the potential for the emplacement of significant gold mineralization on the project. The Lapon Project is located within the Walker Lane shear zone, a 100 kilometre wide structural corridor extending in a southeast direction from Reno, Nevada. Within this trend, numerous gold, silver, and copper mines are located, notably the historic Comstock Lode mines in Virginia City, the past producing Esmeralda/Aurora gold mine, with reported production of some one million ounces, as well as the Anaconda open pit copper mine in Yerington. Nevada Copper’s new mine, Pumpkin Hollow, is also located within the Wasuk Range about 25 kilometres north of Lapon. The Lapon Project is cut by a series of steeply dipping cross fault structures cutting across the Walker trend, analogous to other cross fault structures responsible for many gold and base metal deposits in the world. These faults are heavily sheared and altered (sericite, iron oxides) with abundant silica. They vary in width from 60 to 300 meters. Four of these structures have been discovered at Lapon, and at least two can be traced for over four kilometers. Gold mineralization is located within echelon structures within these faults. At least one of these shear zones, the Lapon Rose zone was the site of underground development, and shows a minimum strike length of 4 kilometers, has a width of over 60 meters and has a vertical extent of at least 650 meters. Small scale high grade mining began on the project in 1914. Approximately 600 meters of drifts and raises were developed from two adits and a two stamp mill was built. Further limited underground work was carried out, returning numerous assay values in the range of one ounce per ton, with a sample at the end of an adit returning 20.6 ounces per ton. (National Instrument 43-101, Montgomery and Barr, 2004). E.Gauthier, Geol, Eng (OIQ) acts as the qualified person to the Company and has approved the contents of this release. E.Gauthier, Geol, Eng (OIQ) acts as the qualified person to the Company and has approved the contents of this release. ON BEHALF OF THE BOARD OF DIRECTORS Michel David, Chief Executive Officer and Director FOR FURTHER INFORMATION PLEASE CONTACT: Walker River Resources Corp. (TEL)- (819) 874-0030, (FAX)-(819) 825-1199 Email: info@wrrgold.com Website: www.wrrgold.com NEITHER TSX VENTURE EXCHANGE NOR ITS REGULATION SERVICE PROVIDER (AS THAT TERM IS DEFINED IN THE POLICIES OF THE TSX VENTURE EXCHANGE) ACCEPTS RESPONSIBILITY FOR THE ADEQUACY OR ACCURACY OF THIS NEWS RELEASE. Vancouver, B.C. July 6, 2017 – Walker River Resources Corp. (“Walker” or the “Company”) (TSX-V: “WRR”) is pleased to announce that it has increased its ownership and land holdings at the Lapon Canyon gold project, located approximately 60 kilometres southeast of Yerington, Nevada (the “Lapon Project”). The Company has completed all requirements set out in the mining lease agreement with the original owners of the Lapon Project (D. Potts Trust) and has proceeded with the buyout of the lease agreement. ($217,000 USD). The original owners retain a 1% N.S.R on the Lapon Project. The claims have been duly registered in the name of the Company’s wholly owned Nevada corporation, Walker River Resources, LLC. Additionally, Walker has increased its land holdings at the Lapon Project by acquiring through staking, an additional 60 claims covering the strike and dip extensions of the altered and mineralized zones discovered by geological mapping conducted by the Company’s geologists, and confirmed by the 2015 and 2016 drill programs. The Lapon Project now consists of 96 claims (1,940 acres) situated in the Wassuk Range, easily accessible by secondary state roads from the main highway (25 kilometres). A state grid power transmission line passes within three kilometres of the Lapon Project. Finally, the Company is also pleased to announce it has increased its ownership of the Lapon Project to 100% by entering into a property purchase agreement with Nevada Canyon Gold Corp. (“Nevada Canyon”) to purchase Nevada Canyon’s 30% interest in the Lapon Project. Under terms of the property purchase agreement, the Company will acquire Nevada Canyon’s 30% interest in the Lapon Project in exchange for 9,100,000 common shares of the Company and warrants to acquire an additional 11,900,000 common shares. Each warrant is exercisable for a period of five years without further consideration into one common share in the capital of the Company. The terms of the warrants contain a provision that Nevada Canyon cannot exercise any warrants which would result in it owning 10% or more of the issued and outstanding shares of the Company. Closing of the agreement with Nevada Canyon is subject to the acceptance of the TSX Venture Exchange. About the Lapon Project Previous geological mapping and prospecting on the Lapon Project demonstrated the potential for the emplacement of significant gold mineralization. Drilling in late 2015 and 2016 confirmed this potential. Drilling highlights (previously announced) included 77.62 g/t Au over 12.2 meters (uncut); 48.02 g/t over 13.7 meters (uncut); 39.17 g/t over 9.2 meters (uncut); among others. The drill program confirmed the potential for the emplacement of significant gold mineralization on the project. The Lapon Project is located within the Walker Lane shear zone, a 100 kilometre wide structural corridor extending in a southeast direction from Reno, Nevada. Within this trend, numerous gold, silver, and copper mines are located, notably the historic Comstock Lode mines in Virginia City, the past producing Esmeralda/Aurora gold mine, with reported production of some one million ounces, as well as the Anaconda open pit copper mine in Yerington. Nevada Copper’s new mine, Pumpkin Hollow, is also located within the Wasuk Range about 25 kilometres north of Lapon. The Lapon Project is cut by a series of steeply dipping cross fault structures cutting across the Walker trend, analogous to other cross fault structures responsible for many gold and base metal deposits in the world. These faults are heavily sheared and altered (sericite, iron oxides) with abundant silica. They vary in width from 60 to 300 meters. Four of these structures have been discovered at Lapon, and at least two can be traced for over four kilometers. Gold mineralization is located within echelon structures within these faults. At least one of these shear zones, the Lapon Rose zone was the site of underground development, and shows a minimum strike length of 4 kilometers, has a width of over 60 meters and has a vertical extent of at least 650 meters. Small scale high grade mining began on the project in 1914. Approximately 600 meters of drifts and raises were developed from two adits and a two stamp mill was built. Further limited underground work was carried out, returning numerous assay values in the range of one ounce per ton, with a sample at the end of an adit returning 20.6 ounces per ton. (National Instrument 43-101, Montgomery and Barr, 2004). E.Gauthier, Geol, Eng (OIQ) acts as the qualified person to the Company and has approved the contents of this release. ON BEHALF OF THE BOARD OF DIRECTORS Michel David, Chief Executive Officer and Director FOR FURTHER INFORMATION PLEASE CONTACT: Walker River Resources Corp. (TEL)- (819) 874-0030, (FAX)-(819) 825-1199 Email: info@wrrgold.com Website: www.wrrgold.com NEITHER TSX VENTURE EXCHANGE NOR ITS REGULATION SERVICE PROVIDER (AS THAT TERM IS DEFINED IN THE POLICIES OF THE TSX VENTURE EXCHANGE) ACCEPTS RESPONSIBILITY FOR THE ADEQUACY OR ACCURACY OF THIS NEWS RELEASE. Vancouver, B.C. May 10, 2017 – Walker River Resources Corp. (“Walker” or the “Company”) (TSX-V: “WRR”) is pleased to update its exploration program on the Lapon Canyon gold project, located approximately 60 kilometres southeast of Yerington, Nevada. The Lapon Project consists of 36 claims (720 acres) situated in the Wassuk Range, easily accessible by secondary state roads from the main highway (25 kilometres). A state grid power transmission line passes within three kilometres of the property. Initial drilling on the property was carried out in 2015 and 2016. Highlights (previously announced in 2016) included RC drill hole LC 16-10 intersecting 77.62 g/t Au (uncut) over 12.2 meters; and 48.02 g/t (uncut) over 13.7 meters; RC drill hole LC 16-12 intersected 39.17 g/t Au (uncut) over 9.2 meters; among other significant results. The drill program confirmed the potential for the emplacement of significant gold mineralization on the project. Because of these significant drill results, the Company has now outlined an additional 20,000 feet of drilling. Drill access, drill road maintenance, and pad emplacement is presently underway, with the Notice Level Exploration Plan Surface Management Notice approved by the Bureau of Land Management (BLM). Drilling is scheduled to begin in June of this year. The Lapon project is located within the Walker Lane shear zone, a 100 kilometre wide structural corridor extending in a southeast direction from Reno, Nevada. Within this trend, numerous gold, silver, and copper mines are located, notably the historic Comstock Lode mines in Virginia City, the past producing Esmeralda/Aurora gold mine, with reported production of some one million ounces, as well as the Anaconda open pit copper mine in Yerington. Nevada Copper’s new mine, Pumpkin Hollow, is also located within the Wasuk Range about 25 kilometres north of Lapon. The Lapon project is cut by a series of steeply dipping cross fault structures cutting across the Walker trend, analogous to other cross fault structures responsible for many gold and base metal deposits in the world. These faults are heavily sheared and altered (sericite, iron oxides) with abundant silica. They vary in width from 60 to 300 meters. Four of these structures have been discovered at Lapon, and at least two can be traced for over four kilometers. Gold mineralization is located within en echelon structures within these faults. At least one of these shear zones, the Lapon Rose zone was the site of underground development, and shows a minimum strike length of 4 kilometers, has a width of over 60 meters and has a vertical extent of at least 650 meters. Small scale high grade mining began on the project in 1914. Approximately 600 meters of drifts and raises were developed from two adits and a two-stamp mill was built. Further underground work was carried out on the Project in the following years, including the installation of a ball mill and milling facilities. Finally, the Company is pleased to announce the appointment of Mr. Chris Hobbs, CA, as Chief Financial Officer. Mr. Hobbs has worked with several public companies, accounting and securities firms in an accounting, management, directorship and CFO role in the past 20 years. Mr. Hobbs is a member of the Chartered Accountants of Ontario and holds a bachelor of business administration degree from the Schulich School of Business at York University. E.Gauthier, Geol, Eng (OIQ) acts as the qualified person to the company and has approved the contents of this release. ON BEHALF OF THE BOARD OF DIRECTORS Michel David, Chief Executive Officer and Director FOR FURTHER INFORMATION PLEASE CONTACT: Walker River Resources Corp. (TEL)- (819) 874-0030, (FAX)-(819) 825-1199 Email: info@wrrgold.com Website: www.wrrgold.com NEITHER TSX VENTURE EXCHANGE NOR ITS REGULATION SERVICE PROVIDER (AS THAT TERM IS DEFINED IN THE POLICIES OF THE TSX VENTURE EXCHANGE) ACCEPTS RESPONSIBILITY FOR THE ADEQUACY OR ACCURACY OF THIS NEWS RELEASE. Walker River Resources Corp. (“Walker” or the “Company”) (TSX-V: “WRR”) is pleased to announce that it intends to complete a non-brokered private placement of up to 10,000,000 units (the “Units”, and each a “Unit”) at a price of $0.07 per Unit to raise aggregate proceeds of up to $700,000 (the “Private Placement”). Each Unit shall consist of one common share (the “Share”) and one Share purchase warrant (the “Warrant”), whereby each Warrant shall be exercisable into one Share for a period of two (2) years from closing at a price of $0.12 per Share. The Warrants shall contain an acceleration provision that, in the event the closing sale price of Walker’s Shares on the TSX Venture Exchange is $0.25 or greater for a period of ten (10) consecutive trading days, then the warrant holders will have thirty (30) days to exercise their warrants; otherwise the warrants will expire on the 31st day. Proceeds of the private placement will be used for work on the company’s mineral properties and general working capital. The Company shall pay finder’s fees in respect of subscriptions from investors introduced by finders. The finder’s fee shall be payable in cash and Warrants equal to 8% of the Units sold to investors introduced by finders. All securities to be issued in connection with Private Placement shall be subject to a four-month hold period in accordance with applicable securities legislation. Closing of the Private Placement shall be subject to receipt of acceptance by the TSX Venture Exchange. ON BEHALF OF THE BOARD OF DIRECTORS Michel David, Chief Executive Officer and Director FOR FURTHER INFORMATION PLEASE CONTACT: Walker River Resources Corp. (TEL)- (819) 874-0030, (FAX)-(819) 825-1199 Email: info@wrrgold.com Website: www.wrrgold.com NEITHER TSX VENTURE EXCHANGE NOR ITS REGULATION SERVICE PROVIDER (AS THAT TERM IS DEFINED IN THE POLICIES OF THE TSX VENTURE EXCHANGE) ACCEPTS RESPONSIBILITY FOR THE ADEQUACY OR ACCURACY OF THIS NEWS RELEASE. RC drill hole LC 16-10 intersected 77.62 grams per tonne gold over 12.2 meters uncut (15.38 g/t cut) from 54.9 to 67.2 meters. A second zone in RC drill hole LC 16-10 intersected 48.02 grams per tonne gold over 13.7 meters uncut (7.2g/t cut) from 1.5 to 15.2 meters. RC drill hole LC 16-11 intersected 39.17 grams per tonne gold over 9.2 meters uncut (10.5 g/t cut) from 15.2 to 24.4 meters. *Grades Cut to 34.28g/t Au (1 oz/ton) **True widths approx. 80% in LC 16-09,10, and 12. 70% in LC 16-04. RC drill hole’s 9, 10, and 12 were drilled in the Upper Lapon Rose zone in an altered sheared and faulted granodiorite and quartz monozonite porphyry. Alteration consists of sericite,FeOx and MnOx, secondary sulphidization, intruded by a series of flat lying altered quartz porphyry dykes. RC drill hole LC 15- 04 intersected a mineralized cross fault structure in previously unmineralized diorite. RC drill hole LC 16-10 was designed to verify the position of previously reported, presently inaccessible mined out area. The drill hole successfully intersected the mined-out stope at the reported location and verified the width at some 8 meters at a depth of 68 meters. It is significant that the gold mineralization encountered in LC 16-10 was encountered from 54.9 to 67.1 meters, only 0.8 meters from the stope. The Lapon Project consists of 36 claims (720 acres) situated in the Wassuk Range, easily accessible by secondary state roads from the main highway (25 kilometres). A state grid power transmission line passes within three kilometres of the property. The Lapon project is located within the Walker Lane shear zone, a 100-kilometre-wide structural corridor extending in a southeast direction from Reno, Nevada. Within this trend, numerous gold, silver, and copper mines are located, notably the historic Comstock Lode mines in Virginia City, the past producing Esmeralda/Aurora gold mine, with reported production of some one million ounces, as well as the Anaconda open pit copper mine in Yerington. Nevada Copper’s new mine, Pumpkin Hollow, is also located within the Wasuk Range about 25 kilometres north of Lapon. The Lapon project is cut by a series of steeply dipping cross fault structures cutting across the Walker trend, analogous to other cross fault structures responsible for many gold and base metal deposits in the world. These faults are heavily sheared and altered (sericite, iron oxides) with abundant silica. They vary in width from 60 to 300 meters. Four of these structures have been discovered at Lapon, and at least two can be traced for over four kilometers. Gold mineralization is located within vertical en echelon structures within these faults. At least one of these shear zones, the Lapon Rose zone, was the site of underground development, and shows a minimum strike length of 4 kilometers, has a width of over 60 meters and has a vertical extent of at least 650 meters. Walker along with its partner, Nevada Canyon Gold Corp. (see news release 09-16-15) intend to pursue an aggressive drill program on this well located, highly prospective gold project. Some 6,000 meters of planned drilling has been outlined, with some 1800 meters completed to date. Small scale high grade mining began on the project in 1914. Approximately 600 meters of drifts and raises were developed from two adits and a two-stamp mill was built. Further limited underground work was carried out, returning numerous assay values in the range of one ounce per ton, with a sample at the end of an adit returning 20.6 ounces per ton. (National Instrument NI 43-101, Montgomery and Barr, 2004) These additional drill results continue to confirm the potential for the emplacement of significant gold mineralization on the Lapon Project. Further results will be released as available. Sampling Methodology, Chain of Custody, Quality Control and Quality Assurance All sampling was conducted under the supervision of the Company’s project geologists and the chain of custody from the drill to the sample preparation facility was continuously monitored. A blank or certified reference material was inserted approximately every tenth sample. The Lapon samples were delivered to ALS Minerals certified laboratory facility in Reno, NV. The samples were crushed, pulverized and the sample pulps digested and analyzed for gold using fire assay fusion and a 50g gravimetric finish. Higher grade samples used a 1kg screen fire assay with screen to 100 microns and 50g gravimetric finish The scientific and technical content and interpretations contained in this news release have been reviewed, verified and approved by E. Gauthier, geol., Eng (OIQ) a Qualified Person as defined by NI 43-101, Standards of Disclosure for Mineral Projects. ON BEHALF OF THE BOARD OF DIRECTORS Michel David, Chief Executive Officer and Director FOR FURTHER INFORMATION PLEASE CONTACT: Walker River Resources Corp. (TEL)- (819) 874-0030, (FAX)-(819) 825-1199 Email: info@wrrgold.com Website: www.wrrgold.com NEITHER TSX VENTURE EXCHANGE NOR ITS REGULATION SERVICE PROVIDER (AS THAT TERM IS DEFINED IN THE POLICIES OF THE TSX VENTURE EXCHANGE) ACCEPTS RESPONSIBILITY FOR THE ADEQUACY OR ACCURACY OF THIS NEWS RELEASE. Vancouver, B.C. August 4th, 2016 – Walker River Resources Corp. (“Walker” or the “Company”) (TSX-V: “WRR”) has begun the drill exploration program on the Lapon Canyon gold project, located approximately 60 kilometres southeast of Yerington, Nevada. The Lapon Project consists of 36 claims (720 acres) situated in the Wassuk Range, easily accessible by secondary state roads from the main highway (25 kilometres). A state grid power transmission line passes within three kilometres of the property. The Lapon project is located within the Walker Lane shear zone, a 100 kilometre wide structural corridor extending in a southeast direction from Reno, Nevada. Within this trend, numerous gold, silver, and copper mines are located, notably the historic Comstock Lode mines in Virginia City, the past producing Esmeralda/Aurora gold mine, with reported production of some one million ounces, as well as the Anaconda open pit copper mine in Yerington. Nevada Copper’s new mine, Pumpkin Hollow, is also located within the Wasuk Range about 25 kilometres north of Lapon. The Lapon project is cut by a series of steeply dipping cross fault structures cutting across the Walker trend, analogous to other cross fault structures responsible for many gold and base metal deposits in the world. These faults are heavily sheared and altered (sericite, iron oxides) with abundant silica. They vary in width from 60 to 300 meters. Four of these structures have been discovered at Lapon, and at least two can be traced for over four kilometers. Gold mineralization is located within en echelon structures within these faults. At least one of these shear zones, the Lapon Rose zone was the site of underground development, and shows a minimum strike length of 4 kilometers, has a width of over 60 meters and has a vertical extent of at least 650 meters. The 2016 Exploration Program is a continuation of the initial drilling program that began in December of 2015, which was designed to explore the upper portion of the Lapon Rose zone. Previous results included 8.41 g/t Au over 12.2 meters in hole 1 (see P.R. 2/02/16) that included 292 g/t over 1.5 meters. The initial drill results confirm the potential for the emplacement of significant gold mineralization on the Project. Walker along with its partner, Nevada Canyon Gold Corp. (see news release 09-16-15) intend to pursue an aggressive drill program on this well located, highly prospective gold project. Some 6,000 meters of planned drilling has been outlined. Small scale high grade mining began on the project in 1914. Approximately 600 meters of drifts and raises were developed from two adits and a two stamp mill was built. Further limited underground work was carried out, returning numerous assay values in the range of one ounce per ton, with a sample at the end of an adit returning 20.6 ounces per ton. (National Instrument 43-101, Montgomery and Barr, 2004) E.Gauthier, Geol, Eng (OIQ) acts as the qualified person to the company and has approved the contents of this release. ON BEHALF OF THE BOARD OF DIRECTORS Michel David, Chief Executive Officer and Director FOR FURTHER INFORMATION PLEASE CONTACT: Walker River Resources Corp. (TEL)- (819) 874-0030, (FAX)-(819) 825-1199 Email: info@wrrgold.com Website: www.wrrgold.com NEITHER TSX VENTURE EXCHANGE NOR ITS REGULATION SERVICE PROVIDER (AS THAT TERM IS DEFINED IN THE POLICIES OF THE TSX VENTURE EXCHANGE) ACCEPTS RESPONSIBILITY FOR THE ADEQUACY OR ACCURACY OF THIS NEWS RELEASE. Vancouver, B.C. April 19, 2016 – Walker River Resources Corp. (“Walker” or the “Company”) (TSX-V: “WRR”) drill program on the Lapon Canyon gold project, located approximately 60 kilometres southeast of Yerington, Nevada. The Company, as announced on Nov. 19, 2015, intends to pursue an aggressive drilling program on this well located, highly prospective gold project. Some 6000 meters of drilling are planned in this initial exploration phase. The first hole was spudded on Dec. 4, 2015, and to date five holes have been completed. These holes were designed to test the upper portion of the Lapon Rose zone. Assay results have been received from the first three holes. Highlights include (see news releases 02-02-16 and 03-23-16) 8.4 g/t over 19.8 meters in RC drill hole LC 15-01, 7.84 g/t over 22.9 meters in RC drill hole LC 15-02, and 7.62 g/t over 18.3 meters in RC drill hole LC 15-03. Geological logging has now been completed on holes 4 and 5. Drilling is scheduled to resume in late May. The Lapon Project consists of 36 claims (720 acres) situated in the Wassuk Range, easily accessible by secondary state roads from the main highway (25 kilometres). A state grid power transmission line passes within three kilometres of the property. The Lapon project is located within the Walker Lane shear zone, a 100 kilometre wide structural corridor extending in a southeast direction from Reno, Nevada. Within this trend, numerous gold, silver, and copper mines are located, notably the historic Comstock Lode mines in Virginia City, the past producing Esmeralda/Aurora gold mine, with reported production of some one million ounces, as well as the Anaconda open pit copper mine in Yerington. Nevada Copper’s new mine, Pumpkin Hollow, is also located within the Wasuk Range about 25 kilometres north of Lapon. The Lapon project is cut by a series of steeply dipping cross fault structures cutting across the Walker trend, analogous to other cross fault structures responsible for many gold and base metal deposits in the world. These faults are heavily sheared and altered (sericite, iron oxides) with abundant silica. They vary in width from 60 to 300 meters. Four of these structures have been discovered at Lapon, and at least two can be traced for over four kilometers. Gold mineralization is located within en echelon structures within these faults. At least one of these shear zones, the Lapon Rose zone was the site of underground development, and shows a minimum strike length of 4 kilometers, has a width of over 60 meters and has a vertical extent of at least 650 meters. Walker along with its partner, Nevada Canyon Gold Corp. (see news release 09-16-15) intend to pursue an aggressive drill program on this well located, highly prospective gold project. Some 6,000 meters of planned drilling has been outlined, with the initial drilling (760 meters) completed in December 2015. Small scale high grade mining began on the project in 1914. Approximately 600 meters of drifts and raises were developed from two adits and a two stamp mill was built. Further limited underground work was carried out, returning numerous assay values in the range of one ounce per ton, with a sample at the end of an adit returning 20.6 ounces per ton. (National Instrument 43-101, Montgomery and Barr, 2004) The initial drill results confirm the potential for the emplacement of significant gold mineralization on the Lapon Project. Further results will be released as available. Sampling Methodology, Chain of Custody, Quality Control and Quality Assurance All sampling was conducted under the supervision of the Company’s project geologists and the chain of custody from the drill to the sample preparation facility was continuously monitored. A blank or certified reference material was inserted approximately every tenth sample. The Lapon samples were delivered to ALS Minerals certified laboratory facility in Reno, NV. The samples were crushed, pulverized and the sample pulps digested and analyzed for gold using fire assay fusion and a 50g gravimetric finish. Higher grade samples used a 1kg screen fire assay with screen to 100 microns and 50g gravimetric finish The scientific and technical content and interpretations contained in this news release have been reviewed, verified and approved by E. Gauthier, geol., Eng (OIQ) a Qualified Person as defined by NI 43-101, Standards of Disclosure for Mineral Projects. ON BEHALF OF THE BOARD OF DIRECTORS Michel David, Chief Executive Officer and Director FOR FURTHER INFORMATION PLEASE CONTACT: Walker River Resources Corp. (TEL)- (819) 874-0030, (FAX)-(819) 825-1199 Email: info@wrrgold.com Website: www.wrrgold.com NEITHER TSX VENTURE EXCHANGE NOR ITS REGULATION SERVICE PROVIDER (AS THAT TERM IS DEFINED IN THE POLICIES OF THE TSX VENTURE EXCHANGE) ACCEPTS RESPONSIBILITY FOR THE ADEQUACY OR ACCURACY OF THIS NEWS RELEASE. Vancouver, B.C. March 23, 2016 – Walker River Resources Corp. (“Walker” or the “Company”) (TSX-V: “WRR”) is pleased to announce results from the reverse circulation (“RC”) drill program on the Lapon Canyon gold project, located approximately 60 kilometres southeast of Yerington, Nevada. The initial drill program was designed to test the upper portion of the Lapon Rose zone. RC drill hole LC-15-03 tested the continuity of the gold mineralization discovered in RC drill hole LC15-02 (7.84 g/t Au over 22.3 meters, previously announced on 02-02-16), and was drilled approximately 30 meters below RC drill hole LC 15-02, at the eastern contact of the upper shear zone. RC drill hole LC-15-03 intersected 7.62 g/t Au over 19.8 meters. True widths approx. 65% in LC 15-03 The Lapon Project consists of 36 claims (720 acres) situated in the Wassuk Range, easily accessible by secondary state roads from the main highway (25 kilometres). A state grid power transmission line passes within three kilometres of the property. The Lapon project is located within the Walker Lane shear zone, a 100 kilometre wide structural corridor extending in a southeast direction from Reno, Nevada. Within this trend, numerous gold, silver, and copper mines are located, notably the historic Comstock Lode mines in Virginia City, the past producing Esmeralda/Aurora gold mine, with reported production of some one million ounces, as well as the Anaconda open pit copper mine in Yerington. Nevada Copper’s new mine, Pumpkin Hollow, is also located within the Wasuk Range about 25 kilometres north of Lapon. The Lapon project is cut by a series of steeply dipping cross fault structures cutting across the Walker trend, analogous to other cross fault structures responsible for many gold and base metal deposits in the world. These faults are heavily sheared and altered (sericite, iron oxides) with abundant silica. They vary in width from 60 to 300 meters. Four of these structures have been discovered at Lapon, and at least two can be traced for over four kilometers. Gold mineralization is located within en echelon structures within these faults. At least one of these shear zones, the Lapon Rose zone was the site of underground development, and shows a minimum strike length of 4 kilometers, has a width of over 60 meters and has a vertical extent of at least 650 meters. Walker along with its partner, Nevada Canyon Gold Corp. (see news release 09-16-15) intend to pursue an aggressive drill program on this well located, highly prospective gold project. Some 6,000 meters of planned drilling has been outlined, with the initial drilling (760 meters) completed in December 2015. Small scale high grade mining began on the project in 1914. Approximately 600 meters of drifts and raises were developed from two adits and a two stamp mill was built. Further limited underground work was carried out, returning numerous assay values in the range of one ounce per ton, with a sample at the end of an adit returning 20.6 ounces per ton. (National Instrument 43-101, Montgomery and Barr, 2004) The initial drill results confirm the potential for the emplacement of significant gold mineralization on the Lapon Project. Further results will be released as available. Sampling Methodology, Chain of Custody, Quality Control and Quality Assurance All sampling was conducted under the supervision of the Company’s project geologists and the chain of custody from the drill to the sample preparation facility was continuously monitored. A blank or certified reference material was inserted approximately every tenth sample. The Lapon samples were delivered to ALS Minerals certified laboratory facility in Reno, NV. The samples were crushed, pulverized and the sample pulps digested and analyzed for gold using fire assay fusion and a 50g gravimetric finish. Higher grade samples used a 1kg screen fire assay with screen to 100 microns and 50g gravimetric finish The scientific and technical content and interpretations contained in this news release have been reviewed, verified and approved by E. Gauthier, geol., Eng (OIQ) a Qualified Person as defined by NI 43-101, Standards of Disclosure for Mineral Projects. ON BEHALF OF THE BOARD OF DIRECTORS Michel David, Chief Executive Officer and Director FOR FURTHER INFORMATION PLEASE CONTACT: Walker River Resources Corp. (TEL)- (819) 874-0030, (FAX)-(819) 825-1199 Email: info@wrrgold.com Website: www.wrrgold.com NEITHER TSX VENTURE EXCHANGE NOR ITS REGULATION SERVICE PROVIDER (AS THAT TERM IS DEFINED IN THE POLICIES OF THE TSX VENTURE EXCHANGE) ACCEPTS RESPONSIBILITY FOR THE ADEQUACY OR ACCURACY OF THIS NEWS RELEASE. RC drill hole LC 15-01 intersected 1.5m of 292 g/t Au at a depth of 18.3m-19.3m. RC hole LC 15-02 intersected 1.5m of 66.8g/t Au at a depth of 30.5m-32m, including 1.5m of 43.7g/t Au at a depth of 50.3m-51.8m. *Grades cut to 34.28g/t Au (1 oz/ton) **True widths approx. 65% in LC 15-01 1 and 70% in LC 15-02. Drill-hole LC 15-01 was directed to the west to test the western fault contact of the shear zone some 175 meters west of the old workings. Drill-hole LC 15-02 was directed to the east to test the eastern contact of the shear zone and was located some 150 meters from Drill-hole LC15 01. The 2015 Exploration Program began in April and since that date significant exploration progress has been made. Within the upper Lapon Rose Zone, gold mineralization in the form of Visible Gold has been noted in two different locations within the upper adit. The initial drill results confirm the potential for the emplacement of significant gold mineralization on the Project. Additional results from the initial 2015 drill program will be released as they become available. Walker along with its partner, Nevada Canyon Gold Corp. (see news release 09-16-15) intend to pursue an aggressive drill program on this well located, highly prospective gold project. Some 6,000 meters of planned drilling has been outlined, with the initial drilling (760 meters) completed in December 2015. Small scale high grade mining began on the project in 1914. Approximately 600 meters of drifts and raises were developed from two adits and a two stamp mill was built. Further limited underground work was carried out, returning numerous assay values in the range of one ounce per ton, with a sample at the end of an adit returning 20.6 ounces per ton. (National Instrument 43-101, Montgomery and Barr, 2004) Sampling Methodology, Chain of Custody, Quality Control and Quality Assurance All sampling was conducted under the supervision of the Company’s project geologists and the chain of custody from the drill to the sample preparation facility was continuously monitored. A blank or certified reference material was inserted approximately every tenth sample. The Lapon samples were delivered to ALS Minerals certified laboratory facility in Reno, NV. The samples were crushed, pulverized and the sample pulps digested and analyzed for gold using fire assay fusion and a 50g gravimetric finish. Higher grade samples used a 1kg screen fire assay with screen to 100 microns and 50g gravimetric finish The scientific and technical content and interpretations contained in this news release have been reviewed, verified and approved by E. Gauthier, geol., Eng (OIQ) a Qualified Person as defined by NI 43-101, Standards of Disclosure for Mineral Projects. ON BEHALF OF THE BOARD OF DIRECTORS Michel David, Chief Executive Officer and Director FOR FURTHER INFORMATION PLEASE CONTACT: Walker River Resources Corp. (TEL)- (819) 874-0030, (FAX)-(819) 825-1199 Email: info@wrrgold.com Website: www.wrrgold.com NEITHER TSX VENTURE EXCHANGE NOR ITS REGULATION SERVICE PROVIDER (AS THAT TERM IS DEFINED IN THE POLICIES OF THE TSX VENTURE EXCHANGE) ACCEPTS RESPONSIBILITY FOR THE ADEQUACY OR ACCURACY OF THIS NEWS RELEASE. Vancouver, B.C. December 4th, 2015 – Walker River Resources Corp. (“Walker” or the “Company”) (TSX-V: “WRR”) is pleased to announce that drilling has begun on the Lapon Canyon Gold Project , located approximately 60 kilometres southeast of Yerington, Nevada. The Lapon Project consists of 36 claims (720 acres) situated in the Wassuk Range, easily accessible by secondary state roads from the main highway (25 kilometres). A state grid power transmission line passes within three kilometres of the property. The Lapon project is located within the Walker Lane shear zone, a 100 kilometre wide structural corridor extending in a southeast direction from Reno, Nevada. Within this trend, numerous gold, silver, and copper mines are located, notably the historic Comstock Lode mines in Virginia City, the past producing Esmeralda/Aurora gold mine, with reported production of some one million ounces, as well as the Anaconda open pit copper mine in Yerington. Nevada Copper’s new mine, Pumpkin Hollow, is also located within the Wasuk Range about 25 kilometres north of Lapon. Notably, this mine is within Porphyry. The Lapon project is cut by a series of steeply dipping cross fault structures cutting across the Walker trend, analogous to other cross fault structures responsible for many gold and base metal deposits in the world. These faults are heavily sheared and altered (sericite, iron oxides) with abundant silica. They vary in width from 60 to 300 meters. Four of these structures have been discovered at Lapon, and at least two can be traced for over four kilometers. Gold mineralization is located within en echelon structures within these faults. At least one of these shear zones, the Lapon Rose zone was the site of underground development, and shows a minimum strike length of 4 kilometers, has a width of over 60 meters and has a vertical extent of at least 650 meters. The 2015 Exploration Program began in April, since that date significant exploration progress has been made. Within the upper Lapon Rose Zone, gold mineralization in the form of Visible Gold has been noted in two different locations within the upper adit. Walker along with its partner, Nevada Canyon Gold Corp. (see news release 09-16-15) intend to pursue an aggressive drill program on this well located, highly prospective gold project. Some 20 000 feet of planned drilling has been outlined with an initial 6 drill holes (3000 feet) spotted with drill pads completed. Small scale high grade mining began on the project in 1914. The mine area was at the top of the canyon at the Lapon Rose zone, and access to the site in those years was extremely difficult, indicating that the mine was rich enough to drag equipment and supplies up a steep canyon trail. About 600 meters of drifts and raises were developed from two adits and a two stamp mill was built. Further limited underground work was carried out, returning numerous assay values in the range of one ounce per ton, with a sample at the end of an adit returning 20.6 ounces per ton National Instrument 43-101, Montgomery and Barr, 2004) E.Gauthier,geol., Eng (OIQ) acts as the qualified person to the Company and has reviewed and approved the contents of this release. ON BEHALF OF THE BOARD OF DIRECTORS Michel David, Chief Executive Officer and Director FOR FURTHER INFORMATION PLEASE CONTACT: Walker River Resources Corp. (TEL)- (819) 874-0030, (FAX)-(819) 825-1199 Email: info@wrrgold.com Website: www.wrrgold.com NEITHER TSX VENTURE EXCHANGE NOR ITS REGULATION SERVICE PROVIDER (AS THAT TERM IS DEFINED IN THE POLICIES OF THE TSX VENTURE EXCHANGE) ACCEPTS RESPONSIBILITY FOR THE ADEQUACY OR ACCURACY OF THIS NEWS RELEASE. Vancouver, B.C. November 19th, 2015 – Walker River Resources Corp. (“Walker” or the “Company”) (TSX-V: “WRR”) is pleased to announce that the drilling program will begin on Dec. 1, 2015 on the Lapon Canyon gold project, located approximately 60 kilometres southeast of Yerington, Nevada. The Lapon Project consists of 36 claims (720 acres) situated in the Wassuk Range, easily accessible by secondary state roads from the main highway (25 kilometres). A state grid power transmission line passes within three kilometres of the property. The Lapon project is located within the Walker Lane shear zone, a 100 kilometre wide structural corridor extending in a southeast direction from Reno, Nevada. Within this trend, numerous gold, silver, and copper mines are located, notably the historic Comstock Lode mines in Virginia City, the past producing Esmeralda/Aurora gold mine, with reported production of some one million ounces, as well as the Anaconda open pit copper mine in Yerington. Nevada Copper’s new mine, Pumpkin Hollow, is also located within the Wasuk Range about 25 kilometres north of Lapon. Notably, this mine is within Porphyry. The Lapon project is cut by a series of steeply dipping cross fault structures cutting across the Walker trend, analogous to other cross fault structures responsible for many gold and base metal deposits in the world. These faults are heavily sheared and altered (sericite, iron oxides) with abundant silica. They vary in width from 60 to 300 meters. Four of these structures have been discovered at Lapon, and at least two can be traced for over four kilometers. Gold mineralization is located within en echelon structures within these faults. At least one of these shear zones, the Lapon Rose zone was the site of underground development, and shows a minimum strike length of 4 kilometers, has a width of over 60 meters and has a vertical extent of at least 650 meters. The 2015 Exploration Program began in April, since that date significant exploration progress has been made. Within the upper Lapon Rose Zone, gold mineralization in the form of Visible Gold has been noted in two different locations within the upper adit. Walker along with its partner, Nevada Canyon Gold Corp. (see news release 09-16-15) intend to pursue an aggressive drill program on this well located, highly prospective gold project. Some 20 000 feet of planned drilling has been outlined with an initial 6 drill holes (3000 feet) spotted with drill pads completed. Small scale high grade mining began on the project in 1914. The mine area was at the top of the canyon at the Lapon Rose zone, and access to the site in those years was extremely difficult, indicating that the mine was rich enough to drag equipment and supplies up a steep canyon trail. About 600 meters of drifts and raises were developed from two adits and a two stamp mill was built. Further limited underground work was carried out, returning numerous assay values in the range of one ounce per ton, with a sample at the end of an adit returning 20.6 ounces per ton National Instrument 43-101, Montgomery and Barr, 2004) E.Gauthier,geol., Eng (OIQ) acts as the qualified person to the Company and has reviewed and approved the contents of this release. ON BEHALF OF THE BOARD OF DIRECTORS Michel David, Chief Executive Officer and Director FOR FURTHER INFORMATION PLEASE CONTACT: Walker River Resources Corp. (TEL)- (819) 874-0030, (FAX)-(819) 825-1199 Email: info@wrrgold.com Website: www.wrrgold.com NEITHER TSX VENTURE EXCHANGE NOR ITS REGULATION SERVICE PROVIDER (AS THAT TERM IS DEFINED IN THE POLICIES OF THE TSX VENTURE EXCHANGE) ACCEPTS RESPONSIBILITY FOR THE ADEQUACY OR ACCURACY OF THIS NEWS RELEASE. Vancouver, B.C.Sept 16th – Walker River Resources Corp. (“Walker” or the “Company”) (TSX-V: “WRR”) is pleased to announce that it has signed a letter of intent (“LOI”) with Nevada Canyon Gold Corp., (“Nevada Canyon”) is pleased to announce that it entered into an Exploration Agreement with Option form a Joint Venture on its wholly owned Lapon Canyon gold project, located approximately 60 kilometres southeast of Yerington, Nevada, with Nevada Canyon Gold Corp., a private Nevada company. The Lapon Project consists of 36 claims (720 acres) situated in the Wassuk Range, easily accessible by secondary state roads from the main highway (25 kilometres). A state grid power transmission line passes within three kilometres of the property. The Lapon project is located within the Walker Lane shear zone, a 100 kilometre wide structural corridor extending in a southeast direction from Reno, Nevada. Within this trend, numerous gold, silver, and copper mines are located, notably the historic Comstock Lode mines in Virginia City, the past producing Esmeralda/Aurora gold mine, with reported production of some one million ounces, as well as the Anaconda open pit copper mine in Yerington. Nevada Copper’s new mine, Pumpkin Hollow, is also located within the Wasuk Range about 25 kilometres north of Lapon. Notably, this mine is within Porphry. The Lapon project is cut by a series of steeply dipping cross fault structures cutting across the Walker trend, analogous to other cross fault structures responsible for many gold and base metal deposits in the world. These faults are heavily sheared and altered (sericite, iron oxides) with abundant silica. They vary in width from 60 to 300 meters. Four of these structures have been discovered at Lapon, and at least two can be traced for over four kilometers. Gold mineralization is located within en echelon structures within these faults. At least one of these shear zones, the Lapon Rose zone was the site of underground development, and shows a minimum strike length of 4 kilometers, has a width of over 60 meters and has a vertical extent of at least 650 meters. The 2015 Exploration Program began in April, since that date significant exploration progress has been made. Within the upper Lapon Rose Zone, gold mineralization in the form of Visible Gold has been noted in two different locations within the upper adit. Walker River entered into an “LOI” with Nevada Canyon (see news release August 13, 2015) and has now completed a definitive Exploration Agreement with Option to form a Joint Venture. Nevada Canyon will have an option to acquire an initial 25% of the Lapon project for US$250,000 (CDN$325,000) of exploration expenditures within a one year period. An option to acquire a further 25% for an additional US$250,000 (CDN$325,000) of exploration on or before the second anniversary. Following which, a 50/50 joint venture will be formed between Walker River and Nevada Canyon. After formation of the joint venture, Walker River will grant Nevada Canyon a Right of First Refusal (“ROFR”) to earn an additional 20% in the Lapon project by completing the following: an equity investment of US$1,000,000 in Walker River; funding and delivering a complete scoping study on the project; and carrying US$500,000 of post scoping joint venture expenditures pertaining to Walker. Nevada Canyon may accelerate any of the above earn-in periods at its option. Walker shall be the operator of the exploration. With the completed Exploration and Option Agreement, Walker will pursue an aggressive drill program on this well located, highly prospective gold project. Some 20 000 feet of planned drilling has been outlined with an initial 6 drill holes (3000 feet) spotted with drill pads completed. Drilling is planned to begin on or about Sept. 20, 2015. In addition, Walker River and Nevada Canyon’s strategic alliance will benefit from a mutual Right of First Refusal on exploration projects and acquisitions between both companies going forward. This alliance will not only allow Walker to carry out significant work on the Lapon project but identify and pursue further project acquisitions. Small scale high grade mining began on the project in 1914. The mine area was at the top of the canyon at the Lapon Rose zone, and access to the site in those years was extremely difficult, indicating that the mine was rich enough to drag equipment and supplies up a steep canyon trail. About 600 meters of drifts and raises were developed from two adits and a two stamp mill was built. Further limited underground work was carried out, returning numerous assay values in the range of one ounce per ton, with a sample at the end of an adit returning 20.6 ounces per ton. (National Instrument 43-101, Montgomery and Barr, 2004) E.Gauthier,geol., Eng (OIQ) acts as the qualified person to the Company and has reviewed and approved the contents of this release. ON BEHALF OF THE BOARD OF DIRECTORS Michel David, Chief Executive Officer and Director FOR FURTHER INFORMATION PLEASE CONTACT: Walker River Resources Corp. (TEL)- (819) 874-0030, (FAX)-(819) 825-1199 Email: info@wrrgold.com Website: www.wrrgold.com NEITHER TSX VENTURE EXCHANGE NOR ITS REGULATION SERVICE PROVIDER (AS THAT TERM IS DEFINED IN THE POLICIES OF THE TSX VENTURE EXCHANGE) ACCEPTS RESPONSIBILITY FOR THE ADEQUACY OR ACCURACY OF THIS NEWS RELEASE. Vancouver, B.C. August 13th – Walker River Resources Corp. (“Walker” or the “Company”) (TSX-V: “WRR”) is pleased to announce that it has signed a letter of intent (“LOI”) with Nevada Canyon Gold Corp., (“Nevada Canyon”) a private Nevada company, to enter into an Exploration Agreement with Option form a Joint Venture on its wholly owned Lapon Canyon gold project, located approximately 60 kilometres southeast of Yerington, Nevada. The Lapon Project consists of 36 claims (720 acres) situated in the Wassuk Range, easily accessible by secondary state roads from the main highway (25 kilometres). A state grid power transmission line passes within three kilometres of the property. The Lapon project is located within the Walker Lane shear zone, a 100 kilometre wide structural corridor extending in a southeast direction from Reno, Nevada. Within this trend, numerous gold, silver, and copper mines are located, notably the historic Comstock Lode mines in Virginia City, the past producing Esmeralda/Aurora gold mine, with reported production of some one million ounces, as well as the Anaconda open pit copper mine in Yerington. Nevada Copper’s new mine, Pumpkin Hollow, is also located within the Wasuk Range about 25 kilometres north of Lapon. Notably, this mine is within Porphry. The Lapon project is cut by a series of steeply dipping cross fault structures cutting across the Walker trend, analogous to other cross fault structures responsible for many gold and base metal deposits in the world. These faults are heavily sheared and altered (sericite, iron oxides) with abundant silica. They vary in width from 60 to 300 meters. Four of these structures have been discovered at Lapon, and at least two can be traced for over four kilometers. Gold mineralization is located within en echelon structures within these faults. At least one of these shear zones, the Lapon Rose zone was the site of underground development, and shows a minimum strike length of 4 kilometers, has a width of over 60 meters and has a vertical extent of at least 650 meters. The 2015 Exploration Program began in April, since that date significant exploration progress has been made. Within the upper Lapon Rose Zone, gold mineralization in the form of Visible Gold has been noted in two different locations within the upper adit. Walker River has entered into an “LOI” with Nevada Canyon to negotiate a definitive Exploration Agreement with Option to form a Joint Venture. Nevada Canyon will have an option to acquire an initial 25% of the Lapon project for US$250,000 (CDN$325,000) of exploration expenditures within a one year period. An option to acquire a further 25% for an additional US$250,000 (CDN$325,000) of exploration on or before the second anniversary. Following which, a 50/50 joint venture will be formed between Walker River and Nevada Canyon. After formation of the joint venture, Walker River will grant Nevada Canyon a Right of First Refusal (“ROFR”) to earn an additional 20% in the Lapon project by completing the following: an equity investment of US$1,000,000 in Walker River; funding and delivering a complete scoping study on the project; and carrying US$500,000 of post scoping joint venture expenditures pertaining to Walker. Nevada Canyon may accelerate any of the above earn-in periods at its option. Walker shall be the operator of the exploration. Both parties expect to execute an exploration agreement with option to form a joint venture to replace the LOI within the next 30 days. With the completed Exploration and Option Agreement, Walker will pursue an aggressive drill program on this well located, highly prospective gold project. Some 20 000 feet of planned drilling has been outlined with an initial 6 drill holes (3000 feet) spotted with drill pads completed. Drilling is planned to begin on or about Sept. 20, 2015. In addition, Walker River and Nevada Canyon’s strategic alliance will benefit from a mutual Right of First Refusal on exploration projects and acquisitions between both companies going forward. This alliance will not only allow Walker to carry out significant work on the Lapon project but identify and pursue further project acquisitions. Small scale high grade mining began on the project in 1914. The mine area was at the top of the canyon at the Lapon Rose zone, and access to the site in those years was extremely difficult, indicating that the mine was rich enough to drag equipment and supplies up a steep canyon trail. About 600 meters of drifts and raises were developed from two adits and a two stamp mill was built. Further limited underground work was carried out, returning numerous assay values in the range of one ounce per ton, with a sample at the end of an adit returning 20.6 ounces per ton National Instrument 43-101, Montgomery and Barr, 2004) E.Gauthier,geol., Eng (OIQ) acts as the qualified person to the Company and has reviewed and approved the contents of this release. ON BEHALF OF THE BOARD OF DIRECTORS Michel David, Chief Executive Officer and Director FOR FURTHER INFORMATION PLEASE CONTACT: Walker River Resources Corp. (TEL)- (819) 874-0030, (FAX)-(819) 825-1199 Email: info@wrrgold.com Website: www.wrrgold.com NEITHER TSX VENTURE EXCHANGE NOR ITS REGULATION SERVICE PROVIDER (AS THAT TERM IS DEFINED IN THE POLICIES OF THE TSX VENTURE EXCHANGE) ACCEPTS RESPONSIBILITY FOR THE ADEQUACY OR ACCURACY OF THIS NEWS RELEASE. Vancouver, B.C. July 15th, 2015 – Walker River Resources Corp. (“Walker” or the “Company”) (TSX-V: “WRR”) is pleased to announce that all resolutions tabled at the Company`s Annual and Special Meeting on Monday July 13, 2015, were approved by the shareholders. The Company`s newly elected board of directors and management team consists of Mr. Michel David, President, CEO, and Director, Mr. Eugene Gauthier, geol. Eng. (OIQ), CFO, Corporate Secretary, and Director, Mr. Thomas Schuster, Director, and Mr. Denis St. Hilaire, Director. The Company would also like to thank past director Mr. Quinn Field-Dyte for his past efforts on behalf of the Company. ON BEHALF OF THE BOARD OF DIRECTORS Michel David, Chief Executive Officer and Director FOR FURTHER INFORMATION PLEASE CONTACT: Walker River Resources Corp. (TEL)- (819) 874-0030, (FAX)-(819) 825-1199 Email: info@wrrgold.com Website: www.wrrgold.com NEITHER TSX VENTURE EXCHANGE NOR ITS REGULATION SERVICE PROVIDER (AS THAT TERM IS DEFINED IN THE POLICIES OF THE TSX VENTURE EXCHANGE) ACCEPTS RESPONSIBILITY FOR THE ADEQUACY OR ACCURACY OF THIS NEWS RELEASE. Vancouver, B.C. June 9th, 2015 – Walker River Resources Corp. (“Walker” or the “Company”) (TSX-V: “WRR”) is pleased to announce it has progressed with its exploration drilling campaign on Walker’s wholly owned Lapon Canyon gold project, located approximately 60 kilometres southeast of Yerington, Nevada. The Lapon Project consists of 35 claims (720 acres) situated in the Wasuk Range, easily accessible by secondary state roads from the main highway (25 kilometres). A state grid power transmission line passes within three kilometres of the property. The Lapon project is located within the Walker Lane shear zone, a 100 kilometre wide structural corridor extending in a southeast direction from Reno, Nevada. Within this trend, numerous gold, silver, and copper mines are located, notably the historic Comstock Lode mines in Virginia City, the past producing Esmeralda/Aurora gold mine, with reported production of some one million ounces, as well as the Anaconda open pit copper mine in Yerington. Nevada Copper’s new mine, Pumpkin Hollow, is also located within the Wasuk Range about 25 kilometres north of Lapon. Notably, this mine is within Porphry. The Lapon project is cut by a series of steeply dipping cross fault structures cutting across the Walker trend, analogous to other cross fault structures responsible for many gold and base metal deposits in the world. These faults are heavily sheared and altered (sericite, iron oxides) with abundant silica. They vary in width from 60 to 300 meters. Four of these structures have been discovered at Lapon, and at least two can be traced for over four kilometers. Gold mineralization is located within en echelon structures within these faults. At least one of these shear zones, the Lapon Rose zone was the site of underground development, and shows a minimum strike length of 4 kilometers, has a width of over 60 meters and has a vertical extent of at least 650 meters. Exploration work began in April and since that date, significant exploration progress has been made. Within the upper Lapon Rose Zone, gold mineralization in the form of Visible Gold has been noted in two different locations within the upper adit. Samples within this adit were taken for rock identification purposes. The intense alteration and shearing makes on site identification difficult. The samples were cut and studied using a microscope confirming that the in situ rock is Porphry, in all probabilities, a quart monzonite intrusive. Copper mineraization, in the form of malachite and chalcopyrite has also been discovered within the Lapon rose zone. A newly discovered shear/altered zone was discovered some 600 meters east of the Lapon Rose. Evidence of mining activities within this previously unknown zone were discovered with evidence of a collapsed mine portal. Finally, another shear zone, some 1000 meters west of the Lapon Rose zone, shows intense iron oxide mineralization and silicification, with the presence of a previously unknown adit into the center of this new zone. The drill access roads and all drill pad construction are complete, including the sourcing of sufficient water on site for drilling purposes. Six holes have been spotted, with planned lengths varying from 150 to 400 meters. Small scale high grade mining began on the project in 1914. The mine area was at the top of the canyon at the Lapon Rose zone, and access to the site in those years was extremely difficult, indicating that the mine was rich enough to drag equipment and supplies up a steep canyon trail. About 600 meters of drifts and raises were developed from two adits and a two stamp mill was built. Further limited underground work was carried out, returning numerous assay values in the range of one ounce per ton, with a sample at the end of an adit returning 20.6 ounces per ton National Instrument 43-101, Montgomery and Barr, 2004) Surface sampling by Walker returned a value of 0.398 ounces per ton gold in altered and sheared rock from the upper Lapon Rose zone. E. Gauthier, Eng (OIQ) acts as the qualified person to the company and has reviewed the contents of this release. ON BEHALF OF THE BOARD OF DIRECTORS Michel David, Chief Executive Officer and Director FOR FURTHER INFORMATION PLEASE CONTACT: Walker River Resources Corp. (TEL)- (819) 874-0030, (FAX)-(819) 825-1199 Email: info@wrrgold.com Website: www.wrrgold.com NEITHER TSX VENTURE EXCHANGE NOR ITS REGULATION SERVICE PROVIDER (AS THAT TERM IS DEFINED IN THE POLICIES OF THE TSX VENTURE EXCHANGE) ACCEPTS RESPONSIBILITY FOR THE ADEQUACY OR ACCURACY OF THIS NEWS RELEASE. Vancouver, B.C. April 14th, 2015 – Walker River Resources Corp. (“Walker” or the “Company”) (TSX-V: “WRR”) announces it has closed its non-brokered private placement previously announced on April 9, 2015, for gross proceeds of $150,000.00. The non-brokered private placement consisted of 3 million units at a price of five cents per unit. Each unit consists of one common share and one share purchase warrant. Each full warrant will entitle the holder to purchase one additional common share of the company at a price of five cents for a period of two years following the closing date. All securities issued above are subject to a hold period expiring on August 14, 2015, being four months and one day after closing of the private placement. Proceeds of the private placement will be used for work on the company’s mineral properties and for general working capital. The Private Placement is subject to TSX Venture Exchange final acceptance. ON BEHALF OF THE BOARD OF DIRECTORS Michel David, Chief Executive Officer and Director FOR FURTHER INFORMATION PLEASE CONTACT: Walker River Resources Corp. (TEL)- (819) 874-0030, (FAX)-(819) 825-1199 Email: info@wrrgold.com Website: www.wrrgold.com NEITHER TSX VENTURE EXCHANGE NOR ITS REGULATION SERVICE PROVIDER (AS THAT TERM IS DEFINED IN THE POLICIES OF THE TSX VENTURE EXCHANGE) ACCEPTS RESPONSIBILITY FOR THE ADEQUACY OR ACCURACY OF THIS NEWS RELEASE. Vancouver, B.C. April 9th, 2015 – Walker River Resources Corp. (“Walker” or the “Company”) (TSX-V: “WRR”) announces it is arranging a non-brokered private placement. The Company is arranging a non-brokered private placement of up to 3 million units at a price of five cents per unit to raise gross proceeds of up to $150,000. Each unit will consist of one common share and share purchase warrant. Each full warrant will entitle the holder to purchase one additional common share of the company at a price of five cents for a period of two years following the closing date. Proceeds of the placement will be used for work on the company’s mineral properties and for general working capital. The private placement is subject to the acceptance of the TSX Venture Exchange. All securities issued under the private placement will be subject to a four month hold period. ON BEHALF OF THE BOARD OF DIRECTORS Michel David, Chief Executive Officer and Director FOR FURTHER INFORMATION PLEASE CONTACT: Walker River Resources Corp. (TEL)- (819) 874-0030, (FAX)-(819) 825-1199 Email: info@wrrgold.com Website: www.wrrgold.com NEITHER TSX VENTURE EXCHANGE NOR ITS REGULATION SERVICE PROVIDER (AS THAT TERM IS DEFINED IN THE POLICIES OF THE TSX VENTURE EXCHANGE) ACCEPTS RESPONSIBILITY FOR THE ADEQUACY OR ACCURACY OF THIS NEWS RELEASE. Vancouver, B.C. March 24th, 2015 – Walker River Resources Corp. (“Walker” or the “Company”) (TSX-V: “WRR”) is pleased to announce the start-up of its exploration drilling campaign on its wholly owned Lapon Canyon Gold project, located approximately 60 kilometers south of Yerington, Nevada. Walker’s initial drill program will target potential high grade gold mineralization in large cross cutting shear and alteration structures and down dip extensions of previously mined (1930’s) high grade gold mineralization. On site activities are scheduled to begin in mid-April 2015. Results and compilation from this initial drill program will be utilized in the planning of a follow up drilling program. The Lapon Canyon gold project consists of 36 claims (720 acres) located approximately 60 kilometers south of Yerington, Nevada, in the Wasuk Range, easily accessible by secondary state roads from the main highway (25 kilometers). A power transmission line passes within three kilometers of the property. The Lapon Canyon project is located within the Walker Lane shear zone, a 100 km wide structural corridor extending in a southeast direction from Reno. The past producing historic Comstock lode silver/gold mine is located within this trend, as is the past producing Esmeralda/Aurora gold mine, with reported production of about one million ounces. Nevada Copper Corp.’s new mine, Pumpkin Hollow, is also located within the Wasuk Range about 25 km north of Lapon Canyon. The Lapon Canyon project is cut by a series of steeply dipping cross fault structures cutting across the Walker Trend, analagous to other cross fault structures responsible for many gold and base metal deposits in the world. These faults are heavily sheared and altered with abundant silica. They vary in width from 60 to 300 meters. Four of these structures can be seen in Lapon Canyon, and two can be traced over 4 km. The gold mineralization is located within en echelon structures within these faults. Small scale high grade gold mining began in 1914. The mine area was at the top of the canyon and at that time it was extremely difficult to access, indicating that the mineralization was rich enough to drag equipment and supplies up a steep canyon. About 600 meters of drifts were developed and a two stamp mill was built. Further limited underground work was carried out, returning numerous assay values in the range of one ounce per ton, with a sample at the end of an adit returning 20.6 ounces per ton (NI 43-101 Montgomery and Barr, 2004) Surface sampling by Walker returned a result of 0.398 ounces per ton gold (see news release Jan 9, 2014) E.Gauthier,geol., Eng (OIQ) acts as the qualified person to the Company and has reviewed and approved the contents of this release. ON BEHALF OF THE BOARD OF DIRECTORS Michel David, Chief Executive Officer and Director FOR FURTHER INFORMATION PLEASE CONTACT: Walker River Resources Corp. (TEL)- (819) 874-0030, (FAX)-(819) 825-1199 Email: info@wrrgold.com Website: www.wrrgold.com NEITHER TSX VENTURE EXCHANGE NOR ITS REGULATION SERVICE PROVIDER (AS THAT TERM IS DEFINED IN THE POLICIES OF THE TSX VENTURE EXCHANGE) ACCEPTS RESPONSIBILITY FOR THE ADEQUACY OR ACCURACY OF THIS NEWS RELEASE. Vancouver, B.C. March 4th, 2015 – Walker River Resources Corp. (“Walker” or the “Company”) (TSX-V: “WRR”) announces it has closed its non-brokered private placement previously announced on December 17, 2014, for gross proceeds of $300,000.00. The non-brokered private placement consisted of 15 million units at a price of two cents per unit. Each unit consists of one common share and one half of a full share purchase warrant. Each full warrant will entitle the holder to purchase one additional common share of the company at a price of five cents for a period of two years following the closing date. The Company has paid $ 14,400.00 cash in commissions on the private placement, along with 720,000 non-transferable finder’s warrants, each entitling its holder to acquire one common share at $0.05 for a 24-month period after closing of the private placement. All securities issued above are subject to a hold period expiring on June 28, 2015, being four months and one day after closing of the private placement. The private placement was conducted in accordance with the TSX-V bulletin dated April 7, 2014, Discretionary Waivers of five-cent Minimum Pricing Requirement. Net proceeds of the private placement are proposed to be used, in part, towards payment of third party indebtedness, together with general and administrative expenses, including accounting, audit and legal fees, as well as exploration and development expenses. Up to $25,500 of the proceeds will be used towards related party expense payments. The Private Placement is subject to TSX Venture Exchange final acceptance. ON BEHALF OF THE BOARD OF DIRECTORS Michel David, Chief Executive Officer and Director FOR FURTHER INFORMATION PLEASE CONTACT: Walker River Resources Corp. (TEL)- (819) 874-0030, (FAX)-(819) 825-1199 Email: info@wrrgold.com Website: www.wrrgold.com NEITHER TSX VENTURE EXCHANGE NOR ITS REGULATION SERVICE PROVIDER (AS THAT TERM IS DEFINED IN THE POLICIES OF THE TSX VENTURE EXCHANGE) ACCEPTS RESPONSIBILITY FOR THE ADEQUACY OR ACCURACY OF THIS NEWS RELEASE.